I decided to go glitter CAS with the main focus on a pink card and I love how it turned out. Edited to Add-I had meant to add this to Festive Friday but appear to have forgotten-all the glitter, shimmer and touch of pink in the photo are echoed in my card! I have another card for this challenge tomorrow...I love the photo!! 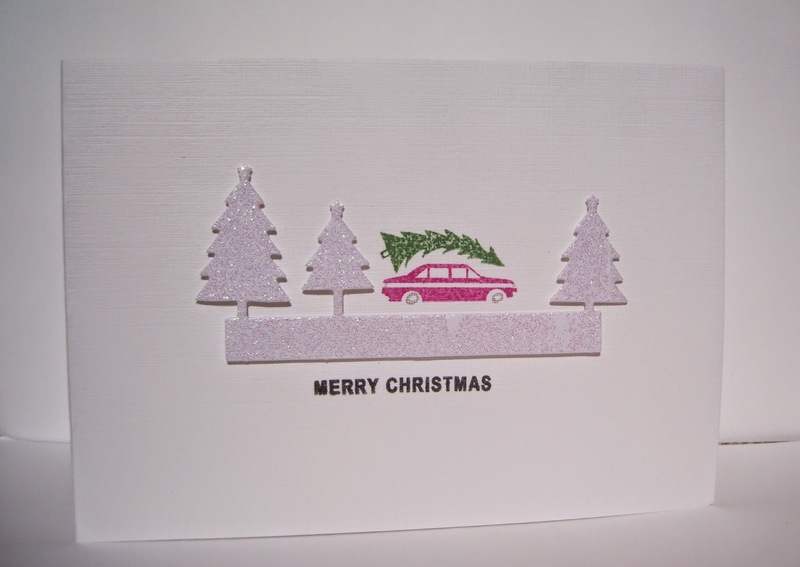 Lovely card Sandie, I like the pine tree bending over the pink car!, and the glitter looks fab! Oh I absolutely love the glitter Sandie! And the pink card is awesome. Thanks so much for playing with us at Fusion. What absolute fun Sandie!!!! Love how CAS it is!!!! Thanks for the shout out Sandie. (... Me .. Sitting here blushing!!!! )....YOU are an inspiration !! Thanks for joining us at FUSION!!! Yahoo, love your style!!! What a stunning design :) Thank you for sharing with Fusion ! Oh Sandie, I love, LOVE this snowy scene you created! It's such a great idea from the inspiration photo. A car in any other color would not have been as fun and unexpected as this pink one, I think. Thanks so much for joining the Fusion Challenge! The touch of glitter adds to the festive feel of this card, it's a great scene! Do make one with the cityscape as well, sounds like a great idea too, and then you've got two more Christmas cards ready! I love how 'out of the blue' you landed on this stunning pink card! The shimmery trees, the car...a most festive, fabulous scene! Can't have enough glitter for Christmas! 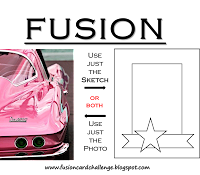 A pink car ... how groovy is that! Perfect combination of these challenges - love the shimmer and shine and the pop of pink! So glad you joined us at Festive Friday (again!) Sandie! What a fun design with those sparkly trees Sandie! This is such a fun design. Love it! This is fantastic and so perfect for the Fusion challenge! Love all that shiny glitter and that little pink car is so cute. Fabulous card and one more for your Xmas collection! TIME OUT's 'Double the Joy' Challenge!